I’ve always been a fan of Neil Simon, but The Good Doctor is one of his lesser-known plays, so I went to Monday night’s dress rehearsal not really having any idea what to expect. And, wow, what a delight it turned out to be. 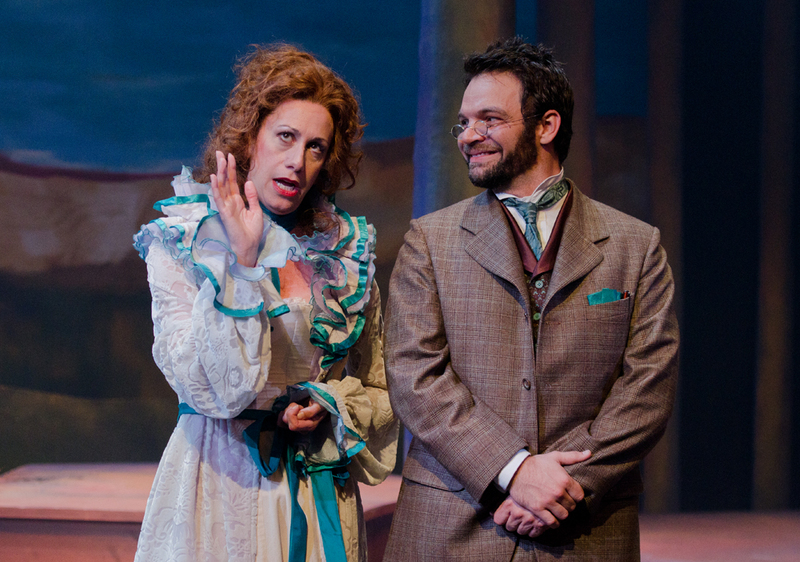 The play, which opens tonight, is a series of sketches based on the short stories of Anton Chekov. (I know: Neil Simon? Anton Chekov? But it works.) The vignettes, set in 19th-century Russia, are all woven together by a narrator—Erik Raymond Johnson, an MFA acting candidate who spends the entire play on the stage. Sometimes he’s the focal point, describing what’s about to happen; other times he’s off to the side watching the action unfold. In all, seven MFA acting students play something like 24 different roles in the course of the evening. In one scene, Lance Beilstein (whom I first saw last summer in Wait Until Dark) is a wild-haired, wild-eyed guy with an excruciating toothache; he stumbles into the dentist’s office only to discover that the “good doctor” is on vacation and he’s at the mercy of an inexperienced amateur who doesn’t have a degree—but does have a few wicked dental instruments. In the very next vignette (talk about a costume change!) he’s a handsome ladies’ man out to seduce another man’s wife. Similarly, Timothy Ellis Riley is hilarious in a sketch called “The Sneeze” as a hapless commoner who goes to a play and ends up sitting behind—and sneezing on—a self-important general (played by Beilstein). Later, Riley is a tramp who earns money by staging his own drowning for three rubles, and later still he’s an adolescent boy whose father (Johnson) sets him up with a prostitute so he can learn the facts of life first-hand. There are some poignant scenes in the play—Carrie McNulty does an amazing monologue in a sketch called “The Audition”—but much of the evening is just plain hilarious. Kira Lace Hawkins alone—as a screaming crazy lady assaulting a bank officer (Beilstein again) in “The Defenseless Creature”—is worth the price of admission. Oh man, can she scream. The Good Doctor opens tonight and runs through Aug. 6, with Saturday matinées tomorrow and Aug. 6. More info is available here. P.S. I took a lot of photos at Monday night’s dress rehearsal, including the two you see here. To see more, check out the photo album on our Facebook page. Entry filed under: University Park. 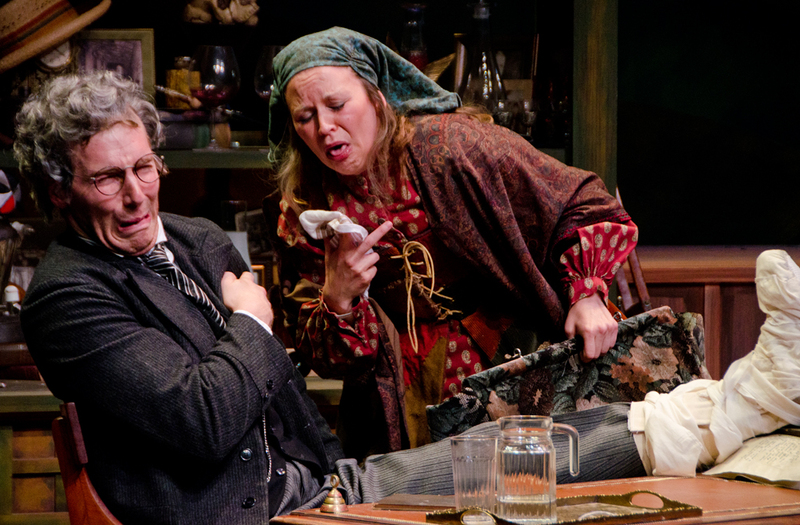 Tags: Anton Chekov, Carrie McNulty, Citizens Bank Downtown Theatre, Erik Raymond Johnson, Kira Lace Hawkins, Lance Beilstein, Neil Simon, Penn State MFA acting program, The Good Doctor, Timothy Ellis Riley.